Okay, I went a little bit mad in Sephora and Duane Reade. I visited Sephora 3 times in the space of a week! 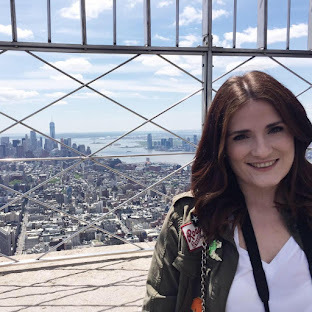 You might have seen on my Instagram, that I recently visited New York with my family. I’ll be writing up a review and NYC travel guide soon, but for now I wanted to show you what beauty bits I bought. 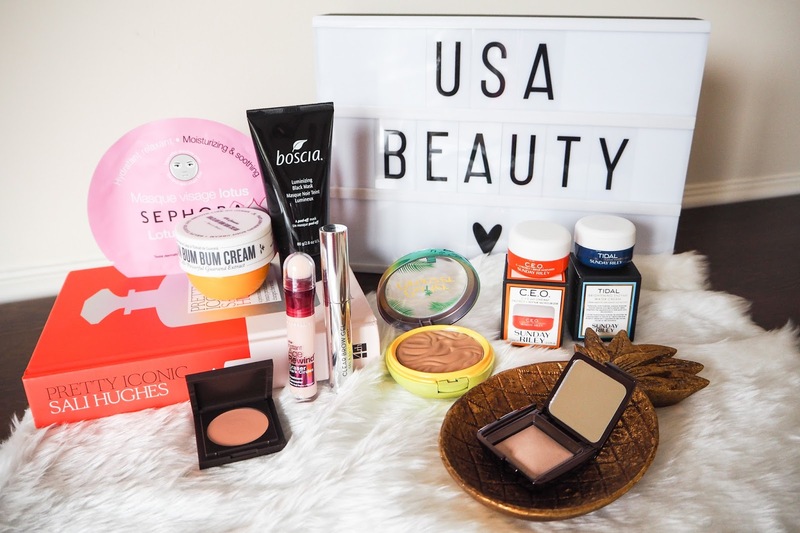 Note, that most of these purchases were influenced by beauty bloggers and YouTubers! I actually headed to the minis section by the till as soon as I got into Sephora. I’m a sucker for sample sizes of products! I’d been wanting to try more from Sunday Riley after purchasing the Luna Oil a few months ago, but there full sized products are a little pricey. 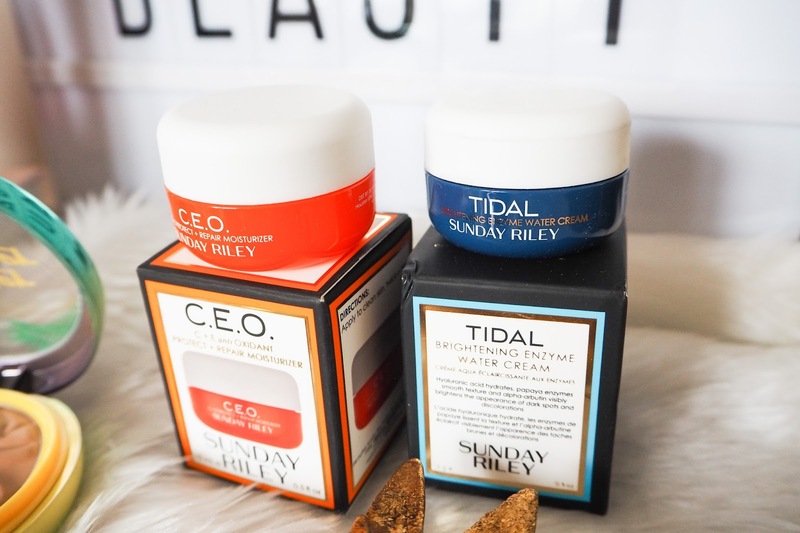 The two travel sizes I picked up from the brand were the C.E.O C+ E anti Oxidant Protect +Repair Moisturiser and the Tidal Brightening EnzymeWater Cream. I’d seen Suzie from Hello October and Alix from I Covet Thee rave about the Tidal moisturiser. It has two types of hyaluronic acid to give a boost of hydration to the skin in seconds. It also has papaya enzymes to exfoliate, leaving brightened skin behind. I picked up the C.E.O moisturiser as I’d seen a few bloggers talk about the amazing properties of Vitamin C. This product has 5% THD Ascorbate (Vitamin C), I’m not sure if this is a high amount, but I thought it was worth a try. Vitamin C helps to prevent and repair UV damage and brightens the skin leaving it looking more youthful. I’ll let you know how I get on in a few weeks time. 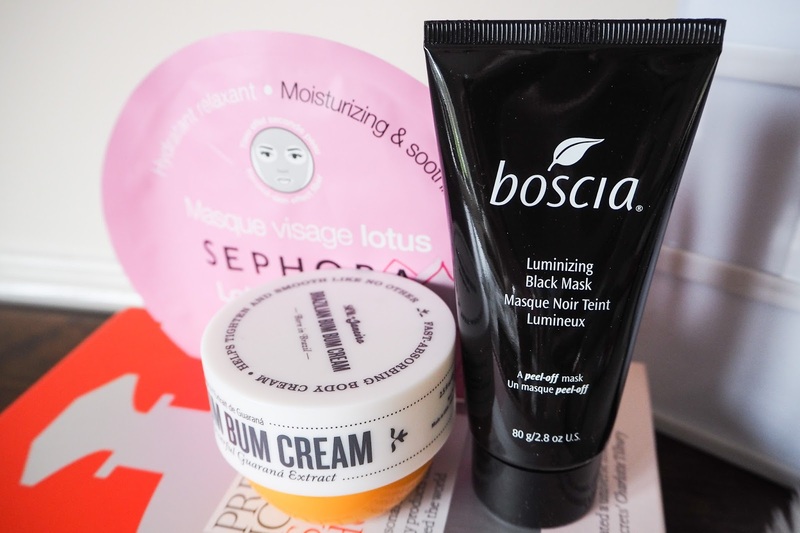 Next up on the skincare front is the Boscia Luminizing BlackMask. We aren’t able to purchase Boscia in the UK, so I wanted to pick something up from America while I was there, just to see what the quality was like and to try something new. I actually picked this face mask up because I noticed the photo of the woman on the front in a black face mask, which looked like those crazy blackhead removal ones. This mask is also peel-off like those viral ones but I’m hoping it isn’t as painful to remove. It claims to minimise the appearance of pores and remove dirt. I can’t wait to try it, I’m sure I’ll update my Instagram Stories with photos of me in the scary looking mask! The next item that went into my basket was the Brazilian BumBum Cream on Jaime Genevieve’s recommendation. Yes, this product has a hilarious name but Jaime says it actually helps to firm the skin, and smells incredible. I can agree with her on the scent, it smells like holidays! Lastly in the skincare section of this haul is the SephoraLotus Face Mask. I pick up these sheet masks every time I visit a Sephora. They are in single sachets making them easy to travel with. I was actually going to apply this on the flight back from America but I was so tired, I slept through most of it. Moving on to makeup, while looking at the Sunday Riley minis, I spotted a tiny version of the Hourglass Ambient Lighting Powder in DimLight. I’ve been dying to try these but couldn’t face shelling out for the full size. I’ve heard this gives a wonderful ‘light from within’ glow to the face. On Amelia Liana’s recommendation, I purchased the Tarte CCUndereye Corrector in Light-Medium. I have dark purple tones under my eyes so I picked this up to put to the test. I swatched this in store and it was very creamy so I’ll have to see how it lasts. I headed the Anastasia stand in hope of falling in love with some of their eyeshadows but the ones I swatched weren’t overly impressive. Instead, I purchased her cult Brow Gel in Clear. I’m hoping this will help battle my eyebrows into shape. I’d also heard a lot of American beauty vloggers talk about Duane Reade as a place to pick up affordable makeup. Most the stands were recognisable brands like Maybelline, Rimmel and L’Oreal but they did have an impressive E.L.F and Physician’s Formula collection in the store I visited. I hunted through the Maybelline stand for the Instant AgeRewind Concealer in Brighten, which isn’t available in the UK. The lightest shade in this country is way too yellow for me, so I hope the brighten shade will be better for me. I already know I love the formula; it’s easy to apply and blends like a dream. 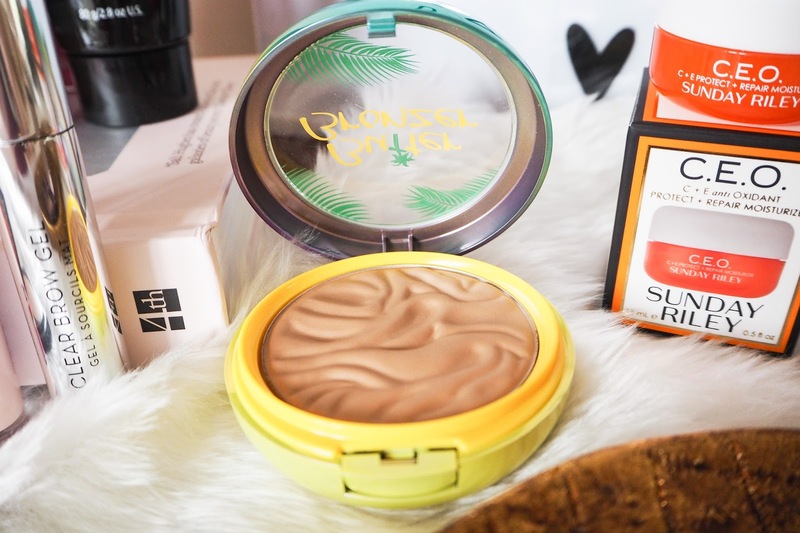 The final product in the huge haul is from Physician’s Formula; their Butter Bronzer is raved about by Tati from Glam Life Guru. From a quick swatch, I can tell why she loves it; it smells like holidays, much like the Brazilian Bum Bum Cream. It’s so buttery to the touch, hence the name. I’m sure I’m going to love the colour too, as it’s a beautiful cool shade that isn’t too orange. It has killed me not being able to play with these items before I took a photo of them. Now, I’m going to get stuck in! I might do a whole follow up post on how I got on with these products after a few weeks of testing; let me know if you would like to see that. Sounds like you had an amazing time shopping around!! Elf is a huge budget brand back home. I remember using it when I was a teen. I'm excited to try them over here.